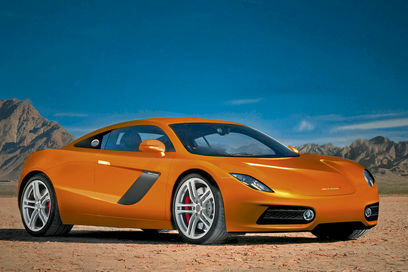 Take a first look at the new baby McLaren which is looking to take on the likes of the Audi R8 and Porsche 911. This entry level model from Formula One racing team McLaren will take on the likes of Audi and Porsche with a price tag of around £80,000. 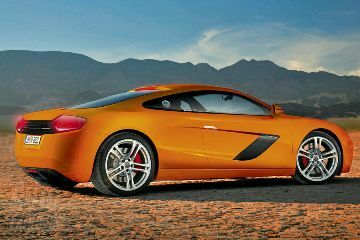 McLaren boss Ron Dennis’ plans to expand McLaren Automotive – the division responsible for the Mercedes SLR McLaren and original F1 road car – into a more mainstream producer. Also expect to see a Ferrari F430 rival in the shape of the P11 and an updated version of the SLR original F1 supercar as well. Ex-Fiat and Ferrari designer Frank Stephenson is styling director and the ‘baby’ comes in slightly smaller than the Audi R8 as you can see by the artists impressions. To keep costs down power is currently coming from a normally aspirated 6.2-litre V8 from Mercedes’ AMG division and running at 450bhp, with a weight of approximately 1,300kg. 0-60mph will be in 4.5 seconds and top speed of 195mph are similar to that of the Audi R8. The only disappointing news? We probably won’t see it until 2012. Props to AE for pics.